We headed back to the Landis Valley Museum yesterday, mainly to see a new baby lamb and to enjoy the grounds in nicer weather than the first time we visited. 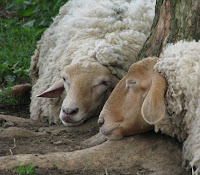 The gardens were blooming, the vegetables were growing, the sheep were sleeping, and my camera was snapping. 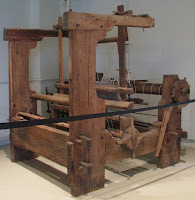 A giant loom was on display in one of the outbuildings and I'm always delighted to find ornamental details even in massive, practical machines like this one. As craftspeople, we just can't help ourselves, can we? 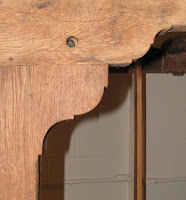 Why have a plain, straight beam mortised into another one, when you can decorate the joint and edges with ogees and stopped chamfers? 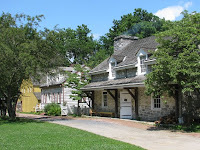 On the grounds are a tavern, gunsmith, blacksmith, and tinsmith shops, a large barn, Victorian homes, a log home, and other structures which include a collections center and agricultural center. 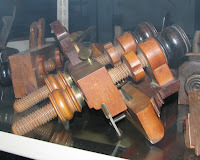 In the agricultural center, behind glass, are several woodworking tools: goosewing axes, handplanes, and a handsome workbench with multiple drawers, a sliding deadman, and leg vise. The planes and bench in particular were in excellent condition. One plow plane was stamped "E.W. Carpenter / Improved Arms & Handle / Lancaster" and looked like it had hardly been used. 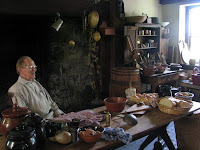 In another historic building—the tavern—we found that the guide had just finished cooking his mid-day meal in an open hearth, so the room smelled like fresh-baked bread. But he wasn't sharing. 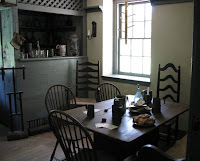 The Landis Valley Museum is a fun place to visit. Just make sure you've eaten lunch first before you reach the tavern, or your stomach will be rumbling like a Conestoga wagon on a country road.